Isaac Mizrahi (Libra) performs cabaret across the country, has written two books, hosted his own television talk show, and made countless appearances in movies and television. 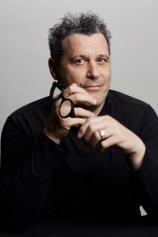 He has directed and designed many productions for the stage and screen. He founded his design company in 1987, was the star and cocreator of the documentary Unzipped, and was the subject of a large-scale, mid-career survey at the Jewish Museum in New York City. He currently develops projects in television, theatre and literature through his own production company, Isaac Mizrahi Entertainment. Isaac Mizrahi offers a poignant, candid and touching look back on his life so far. Growing up gay in a sheltered Syrian Jewish Orthodox family, Isaac had unique talents that ultimately drew him into fashion and later into celebrity circles that read like a who’s who of the 20th and 21st centuries: Richard Avedon, Audrey Hepburn, Anna Wintour, Mikhail Baryshnikov, Meryl Streep and Oprah Winfrey, to name only a few. In I.M., Isaac delves into his lifelong battles with weight, insomnia and depression. He tells what it was like to be an out gay man in a homophobic age and to witness the ravaging effects of the AIDS epidemic.